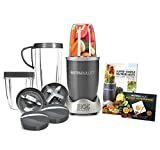 Healthy blender recipes like smoothies, soups and shakes are an excellent addition to almost any kind of diet. The recipes below are some of the best available. They all have fantastic and simple instructions, they are all easy to understand and more importantly, making them will not break the bank!